Weather patterns can be an important part of deciding when to plan your Kauai vacation. We want to provide you with plenty of Kauai weather data to help you make an informed decision. Before we dive into the details, bear in mind that weather history is a fairly descent predictor of future weather. It’s the best tool we have. However, an unusual weather pattern could easily change the actual weather experience. That is true of any destination, not just Kauai. Before we look at Kauai rainfall details, we want to highlight one very interesting pattern about rain in Hawaii — more rain falls overnight than during daytime hours. Rain showers are usually brief. So, keep that in mind as you are considering this data. Even though winter months tend to be a little wetter, we wouldn’t hesitate to book a Hawaii vacation in the winter. In fact, we tend to go to Hawaii quite often in the winter because we love the humpback whale season in Hawaii. Even in the wetter, winter months, t’s been very rare that we’ve encountered rain. We’ve never had a full day that was a complete rainout. Rain in Hawaii brings some benefits that we tourists enjoy. Rain makes the pretty waterfalls flow. (Note that some waterfalls dry up or are only a trickle after a dry summer.) The rain makes Hawaii’s delicious produce grow and the flowers bloom. Last, but not least, after a shower, one of Hawaii’s famous rainbows can be seen. If you have further concerns about rain, read our article — will it rain on my Hawaii vacation? Also, know that there are plenty of fun rainy day activities to enjoy on Kauai. The following chart shows the average monthly rainfall levels based on data collected at Kauai’s main airport in Lihue. With 2.3 inches of rain or less, the driest months range from April through September. The rainiest month is December at 5.2 inches of rain. As you are reviewing rainfall levels throughout the year, another aspect to consider are the micro-climates on the island. Some areas are drier than others. The following map shows the annual rainfall by area. Additionally, take a look at the following Bing bird’s eye view map of the island. The darker greener areas experience the most rainfall. 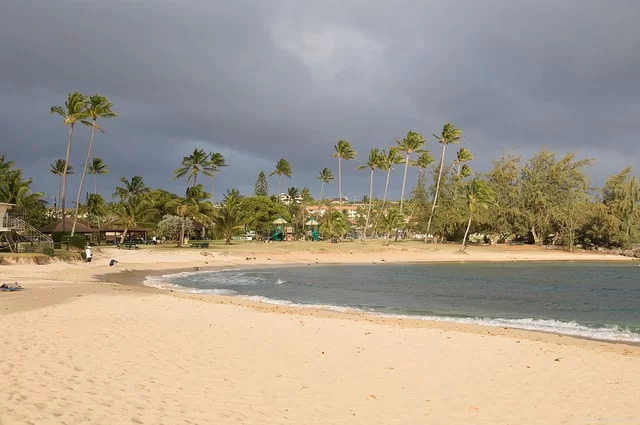 From these two maps, take notice that the popular resort area of Poipu is the driest region, followed by the east side towns of Kapaa and Lihue where many hotels and vacation rentals are. On the North Shore, Princeville is a popular destination with vacation accommodations even though the region gets more than twice the amount of rain as the east and south resort areas. Does that mean that if you choose to stay in Princeville you’ll constantly experience rain? That’s highly unlikely! Remember that most rain falls overnight and rain showers are usually short. That all being said, if you are planning a vacation during a month with above average rainfall levels, it might be a good idea to stay in east or south resort regions to minimize rain. There are no guarantees for better weather, but based on history and probability it’s a safer bet. If you are torn between where to stay on Kauai, consider splitting your time between the different climates. See our post on two different vacation experiences on the same Hawaiian Island. In addition to the Kauai rainfall data, we want to share some of our personal experiences with Kauai weather. We’ve visited Kauai in the months of February, April, May and October. In all those visits, we’ve only experienced one rainy day that ruined our plans. Ironically, that rainy day was in one of the driest months — May. We were also staying in one of the driest regions — Poipu. You can swim year round in Hawaii. For more details, see our Hawaii ocean temperatures article. Per the data on this page, the average humidity is in the low to mid 70%. Most people will agree that 70% is pretty high humidity. Thankfully the prevailing tradewinds from the northeast, keep you comfortable despite the humidity. Occasionally, Kona winds from the southwest make the atmosphere feel hot and sticky. To keep more comfortable in humid weather, we recommend that you stay in a place that has ample air conditioning. We spent a couple of nights in a Poipu condo without air conditioning one April. With a ceiling fan on, by late night, we’d start to feel comfortable in the condo. We vowed then to always stay in accommodations with air conditioning. Wear light, breathable clothing to help you feel more comfortable in the Kauai humidity. The last hurricane, Iniki, that hit Kauai and caused any major damage was in 1992. Hurricane season in Kauai, which runs from June through November, is usually quiet, however 2015 has been an unusually busy season for tropical storms. Have you been to Kauai? What time of year did you go and what was your experience with the weather? I was wondering if there is an iPhone app for govisithawaii.com? I currently use an iPhone 6. Hi Bruce and thanks for your question. We don’t have an app, but the entire site is mobile friendly. You could create bookmark of GoVisitHawaii.com on your iPhone and access the site from there. Hope that helps! what a helpful site!! love it!! We are in Kauai may 24th through June .6th. Looking at the weather report. I only see one day that says it’s sunny. I realize in that you say the rain is brief but to me it looks like major rain storms the whole time we are there. are we ready to much into the weather report? Can we expect more sunny days than what it is showing? We have no way of knowing how much sun and how much rain you’ll experience….no one knows, not even the weather forecasters. The weather can be very changeable and very different from one side of the island to the other. At the end of your vacation, please let us know what sort of weather you encountered. I am planning vacations in Kauai from 10th December to 18th December. Weather forecast is showing rainy weather all these days. Is it a good idea to postpone the vacation plan in Kauai? We can’t tell you if it’s a good idea to postpone or not. Anecdotally, we went to Kauai in September. The forecast showed showers every day. We only experienced a couple of very brief passing showers and the rest of our time was free of rain. We have vacationed in Kaua’i 6 times in September. The skies are usually overcast and a little rain falls most days but is short lived. It still is a paaradise to visit. We like the Hula festival in September. I am planning our honeymoon in late oct/early November. Would you recommend Kauai or Maui at that time of year? You can’t make a bad choice. Both islands would be great to visit in late October and early November. Hi. We are planning a trip to Hawaii mid-late November. We were thinking of a few days on Oahu to see a couple sites, then off to either Kauai or the Big Island for a week. We aren’t relax-on-the-beach people, but we do like to walk, hike, and mountain bike. Based on our preferred activities, would you recommend Kauai or the Big Island? Is a week too long on either island? If Kauai, do you recommend staying in two different locations and is that even possible if we want to rent something with a kitchen? Thanks! Ps. We visited Maui a few years ago and loved it! A week is definitely not too long for Kauai or the Big Island! We leave tomorrow for a week in Kauai and all I see forecasted is rain. My first real vacation in five years and I couldn’t be more depressed about this weather forecast. I hate rain. Read our above reply to Mohit. Chances are you will not have rain the entire time. Thank you, Sheila. I appreciate your response. But constant overcast weather is just as depressing to me as rain. I really love seeing the sun. I hope and expect you’ll see more sun that what the forecast is showing. Let us know how it goes. We are visiting kauai at the moment. This is our 6th visit over the past few years. We typically travel here late Oct/early Nov to avoid the crowds. We’ve noticed it is busier this year with more tourists and not sure why. The weather has always been consistently sunny with occasional rain. However, it has been unusually rainy this year with flash flooding. Every day we must plan our activities around the weather which has been a challenge at times. Overall, we try and go with the flow so we simply adjust our plans accordingly. For those checking the weather forecast “prior” to vacation, take it with a HUGE grain of salt and don’t let it get you down. The weather forecast literally changes daily & rain is almost always predicted at some level on any given day. Like I mentioned, this has never been an issue until this year. My bet is rent a convertible and enjoy all parts of the island. A few tips – food trucks here serve amazing cuisine and easy on the wallet. Kapa’a & Hanapepe Art Walks are festive & fun. We stay in Kapa’a area for its central location and low key vibe. We also love walking the bike path along the ocean down the length of Kapa’a. I could go on and on as we truly love kauai. Definitely our favorite Hawaiian island for all the reasons stated by others. Aloha! Thanks for adding your experience, Sharon. We’ve been catching some of the recent Kauai weather news with this unusual wet spell and hoping for clearing skies for all. We have been going to Kauai for 10+years and have visited in all “seasons”. Most recently, we have preferred to come in December. In regards to rain, the reason Hawaii is so lush and beautiful is because it rains! Most occurs at night. Showers during the day pass quickly usually. If you want a vacation without rain, Hawaii is not for you! Even in Arizona where I live, it rains sometimes. I have been to most of the islands and can honestly say neither has disappointed me. I love Hawaii. Forget about the rain it won’t dampen my spirits. We are looking into visiting Kauai February 2019. What are your thoughts on staying somewhere near the north shores around this time? Have you stayed in this area around this time of year and what was the weather like if so? Thank you in advance for any input. For the reasons we describe in the article, we would and have avoided north shore in the winter. It’s not a guarantee, but just a safer bet to stay elsewhere in the hopes for sunnier weather. Hi, our Kauai vacation starts 9/25-9/30 . I wouldn’t be concerned if the weather forecast said showers, but it is saying Thunderstorms most of our days there. Should we postpone? Unfortunately, your guess is as good as ours. There’s no way for us to know if the possibility of thunderstorms will materialize and if so, how long or intense they may be. Best wishes! We are visiting Kauai over Christmas this year and would like to take a boat tour of the Napali Coast. I understand that boat tours cannot leave from the North Coast that time of year but would we have any issues leaving from the West side? North Shore Na Pali Coast tours can only operate in the summer months, where as tours from the West shore operate year round as long as ocean conditions permit. We want to visit Kauai in June. We love to snorkel. We were told the North shore water is calmer in summer and Poipu area is calmer in winter. Would you agree? That’s generally the case in Hawaii. Overall the surf is much calmer in summer than it is in winter, so snorkeling still may be possible. To get a better understanding, contact a Kauai snorkel equipment supplier or snorkel tour company who have more knowledge than we do about the seasonal ocean patterns.